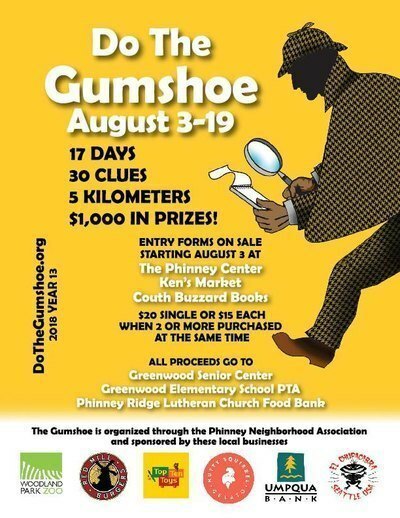 Are you ready to Do The Gumshoe? This annual neighborhood scavenger hunt is a “FUNdraiser” supporting three local non-profits: Greenwood Senior Center, Greenwood Elementary School PTA, and Phinney Ridge Lutheran Church Food Bank. Couth Buzzard is proud to be a pick-up/drop-off point for official entry forms — $20 single, $15 each for two or more forms, cash or check only. Return your completed form by 8/19 for a chance to win one of ten gift cards to a local business! For more information on the Gumshoe 5K, visit their website at dothegumshoe.org. Seattle’s Couth Buzzard Books is proud to announce our latest venture: Couth Buzzard Books Press. Couth Buzzard Press will feature local area writers, graphic artists, and songwriters. Our first book is The Seattle-Tacoma Express: Selected Prose & Poetry:1989-2016 by poet and humorist David Fewtster. Fewster’s book includes writings done during the alternative periodical ‘boom’ in such forgotten rags as Arterial Reader, Point No Point, Pioneer Square Independent, NEO, Open Sound, Emeralds in the Ash, Face II Face, Cups, when it rains from the ground up…, the Stranger–along with a smattering of columns from the Seattle Times ‘Sunday Punch’–a selection from “Diary of a Homeless Alcoholic Suicidal Maniac & Other Picture Postcards”–a chapter from “The Diary of Nanette Jenkins”–horrible jeremiads set in Tacoma–and more. Copies are available at Couth Buzzard Books. The Couth Buzzard Anthology is scheduled to be released in December, 2016 and will feature the works of poets, fiction and non-fiction writers, songwriters, and graphic art who have appeared at Couth Buzzard Books.